It is so much easier to cooperate or work together on a task instead of fighting while doing it. Jack and I cooperated or aided each other positively while doing a project for school, so we were able to get it done quickly and well. On the other hand, John and Emily did not cooperate or help each other at all, so they ended up with a project that was only halfway completed. I’m not really sure why people don’t cooperate or get things done together, especially since there are so many benefits to doing so! Quiz: Try again! If two people decide to cooperate, what are they doing? They each work separately on a task, and compare results after both have finished. They think about doing something together. They do something by joining their efforts. When you cooperate with another person you work together with her or him to get something accomplished. Coop Rate All the hens are cooperating in coop number five, whose rate of laying eggs is great because they are all helping each other lay! 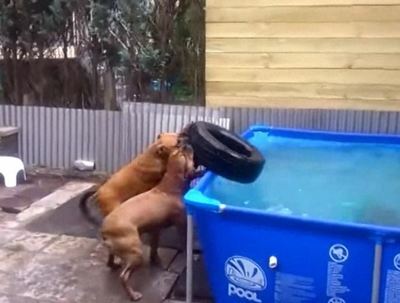 MB SEDLITA [YouTube] These dogs need to cooperate to get that tire out of the water!